Last night I attended a sneak preview of Pink Ribbons, Inc. A Canadian produced documentary about the pink ribbon phenomenon that dominates the breast cancer community. Go see it when it comes to your town. 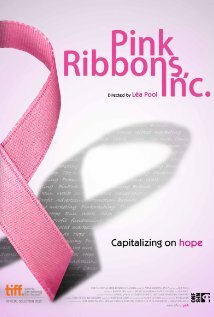 The film highlighted the history of the pink ribbon, the organizations that promote it and the many voices that oppose its usage. Including national breast cancer leader and activist Barbara Brenner, former director of Breast Cancer Action. This film highlighted the usurpation of people’s commitment to stop breast cancer. Women and men walk, jump, run and cycle to raise money for breast cancer awareness. But they don’t march. They don’t demand. Nancy Brinker, the CEO and founder of the Susan G. Komen Race for the Cure, dreams of the day when people with breast cancer can take a pill to manage it the way people with AIDS can take AZT. Wow, really. 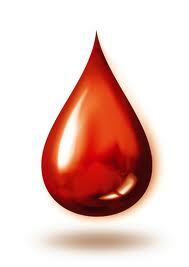 My dream would be to stop the transmission of AIDS and prevent breast cancer in the first place. But I digress. I’m glad she raised the comparison to AIDS because there is a lesson here. It’s obvious that the pink ribbon movement started at the corporate level not at the grassroots. Here’s how I can tell. One of the reasons that AIDS activists were successful in changing the paradigm around illness, disease, treatment and prevention was because they were ACTIVISTS. We didn’t walk (though people do walk and run for AIDs organizations). We practiced civil disobedience. We got in people’s faces. We marched. We lay down in the streets. We disrupted conferences. Religious services. Cultural events. Political events. Many women and men are breast cancer activists. But imagine for a moment if the millions of women and men who walk, ride, jump, cycle for breast cancer slightly changed their mode of transportation and MARCHED. To corporate headquarters. Who pollute our air and water. Who put known carcinogens in our health and beauty products. Who use endocrine disruptors in products that we manufacture and use. Imagine if armies of women marched on shareholder meetings of known polluters. Imagine if legions of women didn’t scale the hills of SF annually but marched to the EPA demanding better regulations and enforcement. Marched to Congress demanding better laws. Marched to the NIH demanding more research on the environmental causes. The civil rights movement didn’t walk. They marched. To the seats of power. The anti-nuke and anti-war movement didn’t walk. They marched. They lay down. They disrupted business as usual for days. The LGBT movement didn’t walk. They marched. Drag queens and all. The US Department of Health and Human Services unveiled nine new designs destined to decorate cigarette packages. The gruesome images depict damaged teeth, diseased lungs, a body marked for an autopsy and a person breathing through a respirator. The markings will cover the upper half of the front and back of cigarette packages produced after September 2012. Plus 20% of the space in cigarette advertisements. 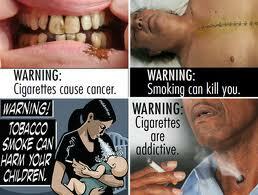 If the government can dictate the packaging on cigarettes, why not dictate the packaging on other products that harm us? Seriously, why don’t they? Why not exercise a little more truth in advertising? For example, a box of ammunition or bullets would show dead bleeding animals. Or men, women and children riddled with bullet holes writhing in pain. The label on a beer bottle could show a male torso suffering from Donelap’s disease – my stomach done lapped over my belt. A bag of potato chips could include images of obese children standing around the edges of the playground, too overweight to play. If you’ve got ideas about products that deserve more truthful messaging, send them here! Is an excellent motto. One that many of us Girl Scouts repeated at the beginning of our meetings. As we carefully placed our right hand over our heart. But sometimes you just can’t be prepared. No matter how hard you try. For example, a good friend of Peg’s and mine learned on Sunday that she had to have emergency surgery on Wed for a mass on her brain. Try preparing for that bit of news. Her wife made a few calls. Sent out a few emails. Revved up the big wheel of friends and loved ones who could help. Though it was hard to know what kind of help was needed and when. The patient didn’t seem to need much at the moment. She was receiving great care and pain meds in the hospital while awaiting surgery*. Until then and a prognosis of her aftercare became apparent. All one could do was call, email, send food and just be available. Fortunately, she was awake, alert and lucid. But what if she weren’t? While talking with them both in the hospital just prior to the operation, I mentioned that we have very little preparation in life for such events. Emotional and logistical. At least, when you have a child, you’ve had several months to rally the troops, notify the press and assign tasks. But in this case you have very little time or none. The patient wisely suggested that we should have emergency hospital bags packed along with key phone numbers and emails. Those of us who live in earthquake country already should have one packed for that likely event. But this is different. Without such preparation, the next of kin or family member must ask…Who should be called when? Who does the patient want in the hospital for support? Who can I rely on in the middle of the night for ANYTHING? Is there a list of people who can just do the heavy lifting without needing much oversight or direction? None of this includes who should be notified about your professional/work life, especially if you own your own business or work alone. But at least it’s a start. The only emergency plan I’ve made is for Peg to call my sister Gail with the bad news. And then my sister gets to tell my mother in person. (Sorry Gail but you do live only a few miles away from Alice.) Other than that Peg will have to sort it out. Fortunately, she’s more than capable on all fronts. But it’s unfair to burden her with handling it all herself. And what if she’s also part of the accident/surgery/emergency? I’m not expecting to experience what my friends are going through. Neither were they. And accidents do happen! I’m looking for good ideas on how to plan. Operators standing by. *The surgery went very well, and they think they got the vast majority of the tumor out. First of all if you’re having one it would probably hurt too much. To laugh. This past Sunday when I thought I was having one. A heart attack. I wasn’t laughing. I was too busy sweating from the sharp pain and burning sensation shooting across my chest. Peg and I were hiking in the late morning above Baker Beach. Heading to the Golden Gate Bridge. When I told her about the pain. Which grew with every footfall and every breath. We stopped hiking and made our way to a small roadside parking lot. Peg dumped our gear and literally ran a mile to our city car share car. Thankfully she was wearing her running shoes. But, she said later, the wrong pants. I called the Kaiser Advice nurse to describe my symptoms. In the past few weeks I had experienced a sharp shooting pain in my chest. Infrequent and short lived. I had read up on the symptoms of heart attacks for women. At that moment, I didn’t have all of them. Only a few. I wondered, do you have to feel 100% of them to have a bona fide heart attack. What if you only feel 30 or 40% of them? Does it still count? Kind of like getting on C on a test instead of an A.
I thought if I am having an attack and die at least my last sight would be a majestic view of my favorite bridge. The Golden Gate. And the mighty Pacific. Unfortunately facing the bridge meant I had to stand either in the middle of the busy narrow trail or in the parking lot. Both were dangerous. What would be worse? Being trampled by runners or being flattened by tourists driving rental cars while suffering a heart attack? I moved. Removing the breath-taking expanse from my sight. I tried not to look conspicuous as I poured out my symptoms to the nurse named Karen on my poorly connected cell phone. Was I nauseous asked the nurse? Kind of but probably from the smell of tar from the railroad tie at my feet. Was I sweating and clammy she asked? Yes, I answered while mopping my brow with the sleeve of my fleece jacket. I had been hiking and the exertion of hiking with severe pains in my chest increased my sweat output. Oh yes and I am a women in my mid 50’s so hot flashes still appear with some regularity. Many thoughts swirled through my head while I described my symptoms. What if I am having a heart attack? Do I have any regrets? Only one. Not finishing my novel. Should I have quit my job and spent my time saving the world? Already spent the last 30 years doing that. And I worked for Greenpeace. What about Peg? And my family and friends? I’d miss them all terribly. An unbearable thought. If I am having a heart attack, it’s surely taking a long time. Don’t they happen suddenly? On TV and in the movies, they do. The Advice nurse remained on the phone with me until Peg drove up to take me to the Kaiser emergency room. Sitting was painful. Standing was painful. Attaching the seat belt across my chest was painful. Peg drove calmly and carefully as I struggled to remove my hiking boots and heavy socks. Which were making me hotter. I reached onto the floor of the seat behind me for my animal print flats. Wincing. Yup fashion came first. Couldn’t go into the hospital wearing clunky hiking boots! After negotiating Kaiser’s labyrinthine parking garage. I hurled the contents of my small hiking pack into the back seat and re-assembled the contents into my navy leather shoulder bag. Yup. Again fashion first. I was going in style. The approach to the emergency room involved scaling a steep incline with and without stairs. Peg held my hand. I reminded her that if something bad happened she needed to call my sister who would tell my mother in person. Peg said she knew the drill but nobody would be calling anyone till we knew something. Once inside, I repeated my story to the receptionist. Barely took a seat before a medical person called me in for an EKG. Small bits of tape attached to my chest, arms and ankles cinched with alligator clips provided the tech with the receptivity to monitor my heart. Peg stood at my side. Did I have a history of heart problems? No but my dad and grandfather did. The EKG was perfect. Wow a huge relief. And my blood pressure was textbook. So what the heck was causing this mind numbing pain in the middle of my chest? Costochondritis, an inflammation of the chest wall. They don’t know what causes it, when it will go away or if it will return. 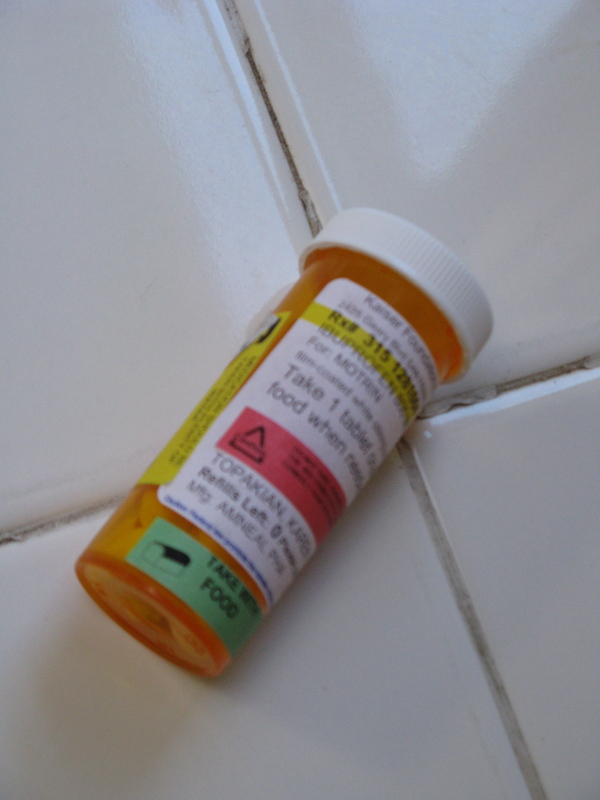 The only medication prescribed is Motrin, an anti-inflammatory that will reduce the pain. And that it does. The pain disappears completely. Until the Motrin wears off, then the excruciating burning throbbing sensation returns with a vengeance. In case you’re wondering about the symptoms for a heart attack in women. The Mayo Clinic has the answers. Chest discomfort or pain This discomfort or pain can feel like a tight ache, pressure, fullness or squeezing in the center of your chest lasting more than a few minutes. This discomfort may come and go. Upper body pain Pain or discomfort may spread beyond your chest to your shoulders, arms, back, neck, teeth or jaw. You may have upper body pain with no chest discomfort. Stomach pain Pain may extend downward into your abdominal area and may feel like heartburn. Shortness of breath You may pant for breath or try to take in deep breaths. This often occurs before you develop chest discomfort. Anxiety You may feel a sense of doom or feel as if you’re having a panic attack for no apparent reason. Lightheadedness You may feel dizzy or feel like you might pass out. Sweating You may suddenly break into a sweat with cold, clammy skin. Nausea and vomiting You may feel sick to your stomach or vomit.